If you asked most anyone who the best goalkeeper in MLS history is, they would answer “Nick Rimando” without a second thought. And now when they do, they have a pretty good stat to back them up — he is the league's all-time winningest goalkeeper. When Real Salt Lake beat the Chicago Fire, 3-1, on Saturday, it marked the 181st win of Rimando's career. That put him ahead of Kevin Hartman atop the league's all-time wins list. Rimando already held the MLS record for clean sheets with 126 and now he has another record to his name. The 37-year-old backstop has played 17 years in MLS, going back to 2000 with the Miami Fusion. He then made a stop with D.C. United before settling in with Real Salt Lake in 2007 and he's been there ever since. 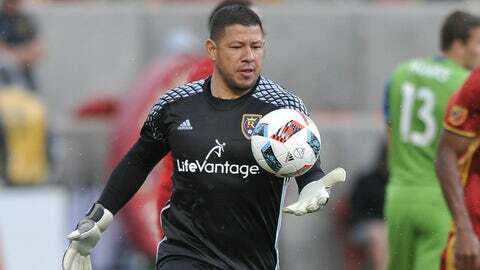 Along with Kyle Beckerman and Javier Morales, Rimando has become the face of the club and helped establish RSL in the community and as one of MLS's more successful outfits. Wins is an imperfect way to judge goalkeepers. There's a reason it's so rarely brought up. But winning the game is the goal for every team and Rimando now has more than anyone else the league has ever seen, which is fitting for the best goalkeeper the league has ever seen. 181 all-time MLS wins for @NickRimando.